"A straight forward and accessible text...Cort s' highly detailed paintings call up concomitant issues and famous faces as well...In dense passages describing political payments between corporate interests and federal narcotics officials, the reproduction-in Cort s' deft watercolors-of memos, official letters, and newspaper articles serves as an indictment of the rule of law with loopholes for the profit minded. This is an excellent introduction to the complexities of 'American interests, ' the realities of corrupt rationale invoked in the pursuit of world health, and the need to take a longer view than the immediate to see how substance and substance abuse both share space and operate on different planes. Right and wrong are not black and white but form a gray of varying shades." "If you hate the War on Drugs, Ricardo Cort's should be one of your favorite illustrators." "Astonishingly addictive and intoxicatingly revelatory, ...Coffee, Coca & Cola offers an impressively open-minded history lesson and an incredible look at the dark underbelly of American Capitalism . . . A stunning, hard cover coffee-table book for concerned adults, this captivating chronicle is a true treasure." "This fascinating and beautifully illustrated piece of visual journalism . . . is as thoroughly researched and absorbingly narrated as it is charmingly illustrated." 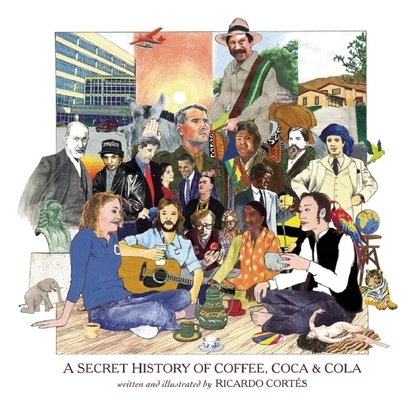 "Any food and culinary history holding will find this a lively survey "
A Secret History of Coffee, Coca & Cola is an illustrated book disclosing new research in the coca leaf trade conducted by The Coca-Cola Company. 2011 marked the 125th anniversary of its iconic beverage, and the fiftieth anniversary of the international drug control treaty that allows Coca-Cola exclusive access to the coca plant. Most people are familiar with tales of cocaine being an early ingredient of "Coke" tonic; it's an era the company makes every effort to bury. Yet coca leaf, the source of cocaine which has been banned in the U.S. since 1914, has been part of Coca-Cola's secret formula for over one hundred years. This is a history that spans from cocaine factories in Peru, to secret experiments at the University of Hawaii, to the personal files of U.S. Bureau of Narcotics Commissioner Harry Anslinger (infamous for his "Reefer Madness" campaign against marijuana, lesser known as a long-time collaborator of The Coca-Cola Company). A Secret History of Coffee, Coca & Cola tells how one of the biggest companies in the world bypasses an international ban on coca. The book also explores histories of three of the most consumed substances on earth, revealing connections between seemingly disparate icons of modern culture: caffeine, cocaine, and Coca-Cola. Coca-Cola is the most popular soft drink on earth, and soft drinks are the number one food consumed in the American diet. Caffeine is the most widely used psychoactive substance. Cocaine . . . well, people seem to like reading about cocaine. An illustrated chronicle that will appeal to fans of food and drink histories (e.g., Mark Kurlansky's Salt and Cod; Mark Pendergrast's For God, Country & Coca-Cola), graphic novel enthusiasts, and people interested in drug prohibition and international narcopolitics, the book follows in the footsteps of successful pop-history books such as Michael Pollan's The Botany of Desire and Eric Schlosser's Fast Food Nation--but has a unique style that blends such histories with narrative illustration and influences from Norman Rockwell to Art Spiegelman.